Engineers are sending out a trash collection device. It is designed to pick up plastic litter. The litter is floating between California and Hawaii. This is an attempt to clean up the world's largest garbage patch. It is in the heart of the Pacific Ocean. The device is 2,000-foot long. It is a floating boom. It is being towed from San Francisco. It is going to the Great Pacific Garbage Patch. The "patch" is an island of trash. It is twice the size of Texas. The system was created by The Ocean Cleanup. It is an organization. 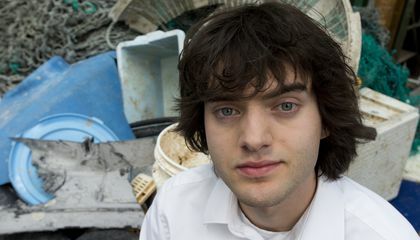 It was founded by Boyan Slat. He is 24-years-old. He is an innovator. He is from the Netherlands. He is passionate about cleaning the oceans. He first wanted to do so when he went scuba diving. He was 16. He was in the Mediterranean Sea. He saw more plastic bags than fish. "The plastic is really persistent. It doesn't go away by itself. The time to act is now," Slat said. He added that researchers with his organization found plastic going back to the 1960s and 1970s. It was bobbing in the patch. The boom is buoyant. It is a U-shaped barrier. It is made of plastic. It has a tapered 10-foot deep screen. It is meant to act like a coastline. It is designed to trap some of the 1.8 trillion pieces of plastic. Scientists think the pieces are swirling in that gyre. But they think it is allowing marine life to safely swim beneath it. The cleanup system has solar power lights. It has cameras. It has sensors. And it has satellite antennas. It will communicate its position at all times. This will allow a support vessel to fish out the collected plastic every few months. Then it can take it to dry land. There it will be recycled, said Slat. Shipping containers will be filled. They will have fishing nets. They will have plastic bottles. They will have laundry baskets. And they will have other plastic refuse. All will be scooped up by the system. It was sent Saturday. It is expected to be back on land within a year, he said. Slat said he and his team will pay close attention to whether the system works well. They want to know if it can stand up to harsh ocean conditions. These include huge waves. He said he's most looking forward to a ship loaded with plastic coming back to port. 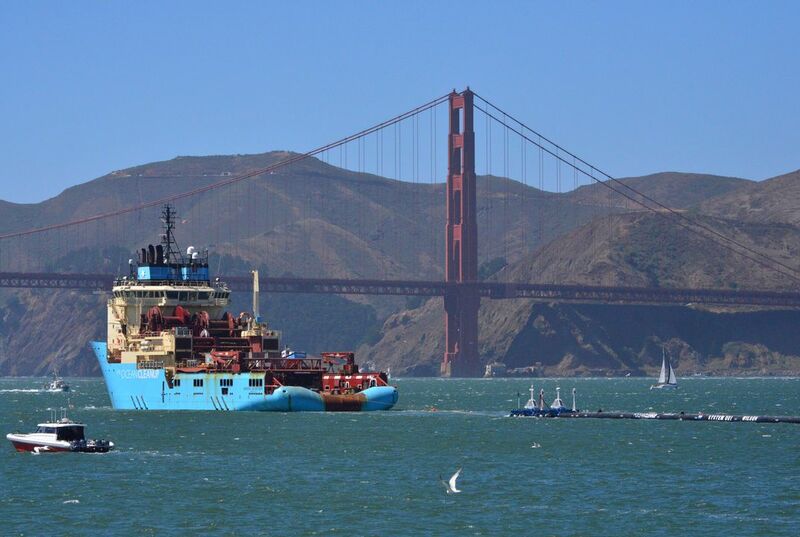 The Ocean Cleanup has raised $35 million. They got it from donations. These were to help fund the project. These include funds from Marc Benioff. He is chief executive of Salesforce.com. Funds also came from PayPal co-founder Peter Thiel. Ocean Cleanup will send out 60 free-floating barriers. They will go out in the Pacific Ocean. They will go out by 2020. The barriers are free-floating. They are made to stand up to harsh weather conditions. And they stand up to constant wear and tear. They will stay in the water for two decades. In that time they will collect 90 percent of the trash in the patch, he added. George Leonard is chief scientist of the Ocean Conservancy. It is a nonprofit environmental advocacy group. He says he's unsure Slat can achieve that goal. He has a concern. He thinks even if plastic trash can be taken out of the ocean, a lot more is pouring in each year. Leonard said 9 million tons of plastic waste enter the ocean every year. A solution must include a multi-pronged approach. This includes stopping plastic from reaching the ocean. It also includes more education. People must reduce their amount of single use plastic containers and bottles. "If you don't stop plastics from flowing into the ocean, it will be a Sisyphean task," Leonard said. He cited the Greek myth of a task never completed. He added that on September 15 about 1 million volunteers around the world will collect trash from beaches and waterways. This is part of the Ocean Conservancy's annual International Coastal Cleanup. Volunteers last year collected about 10,000 tons of plastics worldwide. They did this in over two hours, he said. Leonard also raised concerns that marine and wildlife could get tangled in the net. It will hang below the surface. He said he hopes Slat's group is open with its data. He hopes they share information with the public. He wants them to share what happens with the first deployment. The system will act as a "big boat that stands still in the water.” It will have a screen and not a net. That way there is nothing for marine life to get stuck in. They are being extra careful. A boat will carry marine biologists. It will be sent out to make sure the device is not harming wildlife, Slat said. Most people don't realize where the trash goes and how long it takes to disintegrate. Tons of people just throw all this trash out and it makes this huge problem. All this trash could accumulate because people don't really care where they throw their trash at. People throw their trash away anywhere including the ocean. When people leave things at the beach the waves take it and it is now just floating in the ocean. when people loose a fishing line that is also trash left in the ocean because of the fish. When a hurricane rolls around then there is a lot of trash left in the ocean. During all of these events tons of trash is left in the ocean. Trash is a very dangerous thing for animals such as fish and other seas creatures and this can easily kill such an animal. This is why the invention was created to stop and collect all trash to make clear for all of these animals and to help the fish and others repopulate. The trash can do great damage to all of the animals in the sea. This is why Slat created this invention so there would be no trash in the ocean. I think it accumulated because people just threw their trash on the ground without thinking. People never realized how much trash actually got collected in the ocean. So much trash can accumulate by people littering all the time. People should start recycling and throwing away their trash in the trash can, this can help fix this problem. Another problem that is causing this much trash to accumulate is people not knowing where to dump their trash and them dumping it in the ocean. There could be so much trash because people could be littering on the beach and just leaving trash everywhere. They just be lazy and not care about the world.Also maybe, trash just goes out of garbage bins and the wind picks it up to the ocean. There will not be people having fun out on the ocean because they will have to.Other things in the ocean can get caught in the net.They would have this problem if they didn't throw there stuff away in ocean. When people litter, the trash begins to accumulate very quickly. The people of America think, "One bottle won't hurt", and eventually, it adds up very quickly. people in boats are throwing trash into the ocean, this is not good for the environment and we need to do something about it. Simply throw it into a trash can, and call it good. This helps the environment tremendously and makes you a better person. In cars, people do not usually have a place to throw away their trash so they throw it out the window. You should hang on to your trash until you see a trash can insight so you can help the environment and be the bigger person.